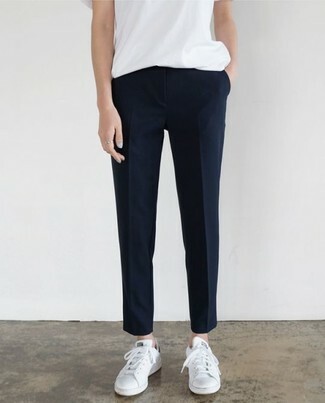 This combo of a white crew-neck t-shirt and navy dress pants is clean, totally stylish and so easy to copy! For something more on the daring side to complement this ensemble, rock a pair of white leather low top sneakers. For a casual totally chic getup, try teaming a grey trenchcoat with navy dress pants — these two pieces the place of work really well together. A pair of red leather high top sneakers will be a stylish addition to your ensemble. 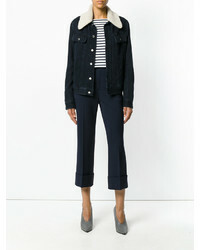 If you're hunting for a casual yet chic outfit, rock a navy blazer with Dsquared2 cropped tailored trousers. Both garments are totally comfy and will look fabulous together. Make white leather low top sneakers your footwear choice to make the look more current. 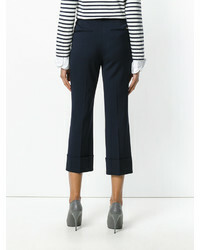 If you're on a mission for a casual yet chic outfit, consider wearing a navy blazer and Dsquared2 cropped tailored trousers from farfetch.com. Both pieces are totally comfy and will look fabulous together. A pair of white and black leather low top sneakers brings the dressed-down touch to the ensemble. For a casually elegant ensemble, pair a pink coat with Dsquared2 cropped tailored trousers — these two pieces play really well together. Go for a pair of black leather slip-on sneakers to make the outfit current. If you're after a casual yet stylish outfit, choose a black leather bomber jacket and Dsquared2 cropped tailored trousers from farfetch.com. Both garments are totally comfy and will look fabulous paired together. And if you want to instantly up the style of your look with one piece, add black and white leather pumps to the equation. This combination of a navy crew-neck sweater and Dsquared2 cropped tailored trousers is the ideal balance between casual and chic. You could perhaps get a little creative when it comes to footwear and elevate your outfit with black leather pumps. If you're on a mission for a casual yet absolutely chic ensemble, try teaming a navy blazer with Dsquared2 cropped tailored trousers. Both items are totally comfy and will look fabulous paired together. When it comes to footwear, this getup is finished off well with white leather oxford shoes. 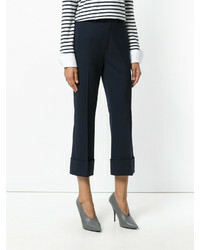 If you don't like trying-too-hard getups, try teaming a white crew-neck t-shirt with navy dress pants. Add a glam twist to your outfit with black leather heeled sandals.